lt;stronggt;FKLF330125lt;/stronggt;lt;BR/gt;Franklin Ultra-Fast Acrylic Floor Finishlt;BR/gt;All-acrylic floor finish formulated for use in ultra high-speed maintenance programs is self-sealing. Goes down clear and stays clear for a slip-resistant finish. Ultra fast recoat minimizes the effects of temperature and humidity during finish application. Added durability allows for excellent appearance levels even in heavy traffic areas. 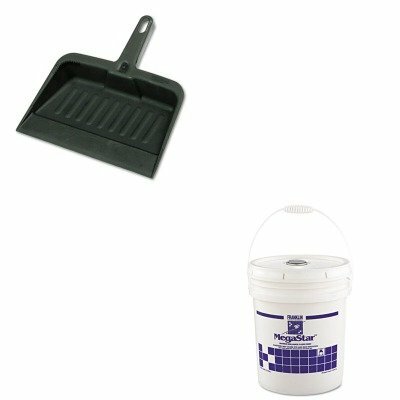 For use on all types of resilient surfaces, mineral surfaces and sealed wood. Application: Sealer Applicable Material: AsphaltLinoleumQuarry TileRubberTerrazzoVinyl.lt;BR/gt;lt;BR/gt;lt;stronggt;RCP2005CHAlt;/stronggt;lt;BR/gt;Franklin Ultra-Fast Acrylic Floor Finishlt;BR/gt;Handy dustpan features a tapered front edge to help simplify sweeping-up. Heavy-duty, moderately flexible plastic provides commercial-grade durability. Lanyard handle-hole allows you to hang and store the pan out of the way. Material(s): Polypropylene; Width: 8 1/4quot;. ~ Includes one dustpan.